Last Thursday, I had one of those days. You know, the ones that by 10:00 you are already so tired you have no idea how you will make it to lunch? And somehow you do, and at 4:00 you’re standing in the driveway and your older son is in hysterics because his little brother committed some atrocity, and now the little one is starting to cry, too, and you’re texting your husband “PLEASE get home as early as is humanly possible” but, oh, your husband didn’t see the text and even if he had, there was a major traffic jam on his drive home. Even on the best days, the time between 4:00 and 5:30 tends to be the most torturously never-ending. Surely it lasts longer than any other 90 minutes of the day. I remember slow days at work feeling like this (on busy days, of course, this time flew by as I attempted to get out in time to relieve the babysitter) and it’s only intensified since I’ve been staying home. By 4:00, we’ve already had the entire day together. Even if one or both kids have been at preschool for some portion of the day, I’m spent. This time of year, it’s getting dark outside; here in North Carolina we can usually play outside, but when the sun starts dipping, it gets cold. The ground is wet. Noah is pretty self-sufficient: zipping around on his bike and making up games like “yard service,” which involves raking leaves or digging holes in the dirt. 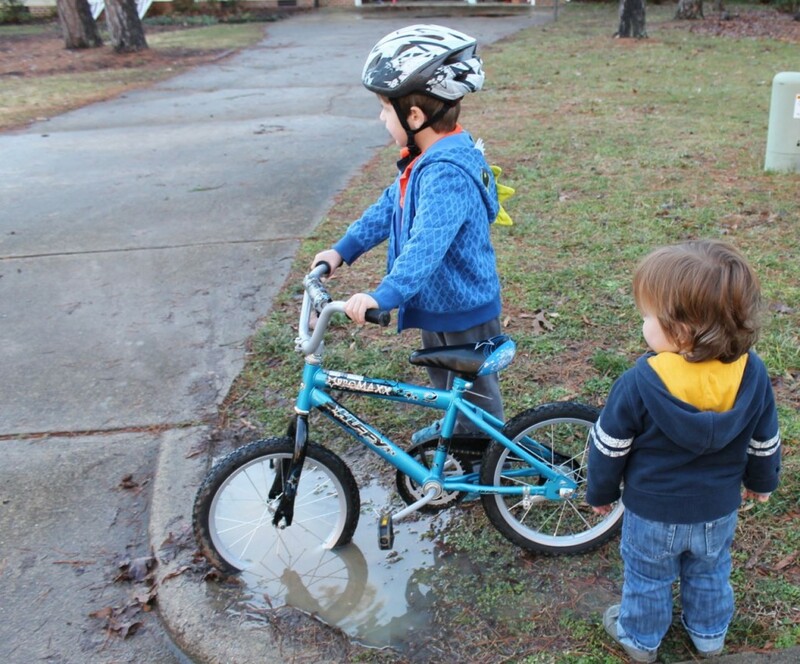 1) Attempt to climb onto your older brother’s bike. Scream bloody murder until someone (read: mom) sits you on it and pushes you around the driveway. After about 30 seconds, start screaming to get off. 2) Squeeze into Cozy Coupe. Scoot around in a circle for 15 seconds until the entire thing tips over, pinning you underneath. Yell for the extraction team to pull you out. Immediately climb back into car. Repeat. 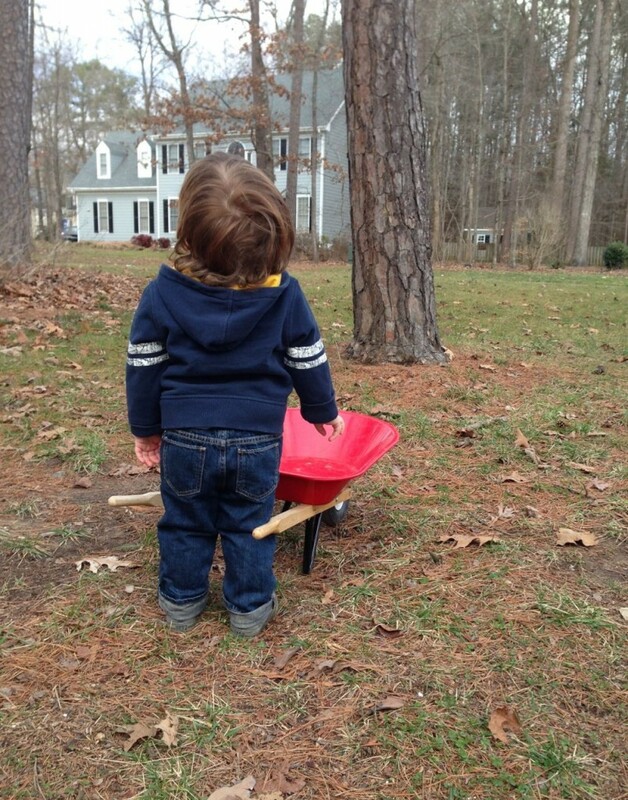 3) Join older brother in your own version of yard service. To play: sit in wet grass. Jab at ground with shovel. When a sufficient amount of dirt has been scooped onto shovel, stick into mouth. Register your disgust with the taste of dirt, and the difficulty of getting it off your hands and out of our mouth, by spitting, crying loudly and swatting at anyone who tries to help you. 4) Push miniature lawnmower down the driveway. Keep going until you’ve reached the street. Proceed down the middle of the street, being sure to ignore any instructions to turn back or move to the side of the road. When mom intervenes, collapse to the ground. Scream like she’s a kidnapper and you’re staging a heroic escape. 5) Find wheelbarrow. Push it around the driveway wailing like you have been sentenced to a life of hard labor on a chain gang. I feel for the guy. I do. He’s at a difficult age, watching all the older boys zip around the driveway and not being able to keep up. And while he’s adding new words every day, he’s not always able to tell me what he wants. Which leads to me guessing incorrectly, and him breaking into an exasperated stream of babbles. In the midst of all this, 5:00 is approaching, and I’m mentally going through the refrigerator trying to figure out what to make for dinner. On good days I may have already decided. But I’ve noticed that my “meal planning” tends to run out of steam after the Wednesday night “Mommy’s going to the gym” dinner of chicken nuggets and French fries. Last Thursday was one of those days. I was totally out of ideas. I brought the kids inside at 5:00, put them in front of the TV and started blankly into the pantry. I went to the fridge to see what vegetables I had to work with. Through the clear plastic crisper drawer I saw some sad looking carrots and a bag of wilted green onions. Back to the pantry. Then: eureka. There, on a bottom shelf of the pantry, was a bag of blue corn tortilla chips left over from the burrito dinner we had earlier in the week. I knew we had cheese and sour cream, too. It wasn’t Tuesday, but we were having soup. This soup is by no means gourmet. It’s a Weight Watchers recipe that I came across ten years ago when I was getting in shape for our wedding. But it’s tasty. And it’s easy: you can have every ingredient waiting for you in the pantry, and preparation basically entails opening cans and dumping them into a pot. As a bonus, the soup is also pretty healthy: low in fat, high in protein and fiber. It can be vegan if you want it to be. But I like to load it with sour cream and cheese. And serve it with tortilla chips, of course. 1. Coat bottom of a large stockpot with cooking spray (I use olive oil). Add onion and garlic and cook, stirring frequently, until the onions are soft but not brown, about 5 minutes. 2. 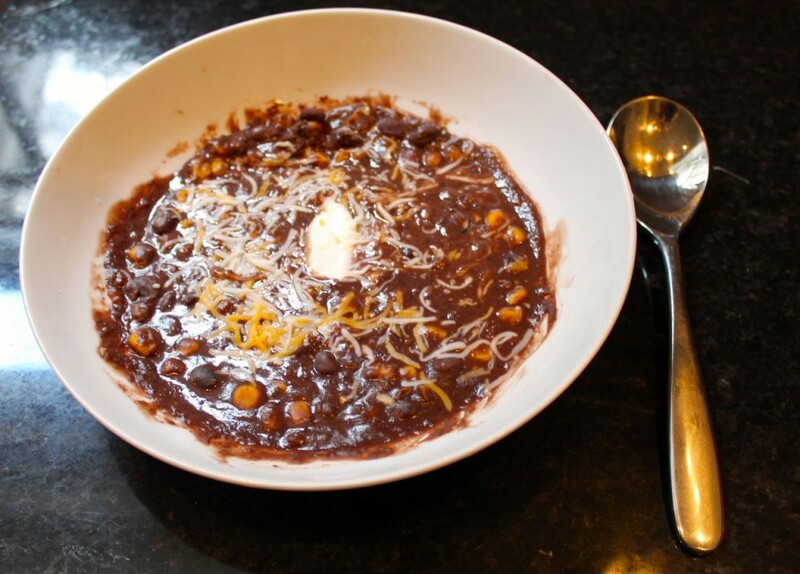 Place one can of beans in blender; add sauteed onion mixture, red pepper flakes and cumin. Cover and blend on high until smooth, about 30 seconds. Pour mixture back into stockpot. 3. Place second can of beans and broth into blender and puree until smooth; add to stockpot. 4. Stir in third can of beans (do not puree first), tomatoes and green chilies, and corn into the stockpot. Bring to a boil, lower heat to medium and simmer for 20 to 25 minutes. *Warning: if you or your kids don’t like spicy, cut way back on the red pepper flakes. The recipe calls for 1/2 teaspoon; I used slightly less than that, and it still had quite a kick. Pat and I liked it, and Rory ate it, but it was too much for Noah. I have to give Noah credit; he tried. I stirred spoonful after spoonful of sour cream into his bowl, and encouraged him to crumble in tortilla chips. Finally, he said, “Mom, it’s too spicy!” and I had to agree. I usually don’t give him an option to eat anything other that what I made for dinner, but this was asking too much. I made him a peanut butter and jelly sandwich. And of course, as soon as he saw Noah’s sandwich, Rory started yelling “Jelly! Jelly!” So I made one for him, too, which he promptly dipped into his bowl of soup and devoured. Because if there’s one area in which Rory and I understand each other, it’s eating. Here’s hoping we figure out the rest soon.